Finally, after a year with bombing, this year instead of NATO bombs, Belgrade has gone trough its second ever audio fair. The first, held in 1998, was a beginning, but in 1999, there was no fair for many reasons. Therefore, this year's fair was in many ways a new beginning - new organizers, new crews and new companies, alongside the old. And some very welcome news. But, read on. The event was held in Belgrade's Hyatt Regency hotel, on the second floor, and practically took a whole wing, since most exhibitors occupied more than one room, often separating home theatre from straight audio, and sometimes separating audio for mere mortals from audio for those with bags of money and time to enjoy all that stuff. It was all much helped by immaculate organization, which, for a change, didn't miss a single beat and shined all the way. Thus, visitors were greeted with excellent organization as they stepped out of the elevator, and from there on, it was smooth sailing to many different choices in sound. Given the events which went on in the country over the last 10 years, such as UN sanctions and NATO bombing, it should surprise no-one that in terms of numbers, it was a small event, with just nine exhibitors. A group of, shall we say unofficial dealers, working via mobile phones and selling from their living rooms, were conspicuously absent, and with them some rather famous names as well, but what was there was not bad at all, as you will see. Let's take it by company. I must apologize for the photography, as shots had to be made under really adverse conditions sometimes; hotel rooms are not at all given to clear photography, all the more so since most equipment was lined up against the windows. This necessitated pulling the curtains to avoid backlighting, but also plunged rooms in almost complete darkness. You can imagine the trouble I had with a camcorder, DV or not. KORATO certainly deserves an honorable mention, as they have been de facto trendsetters for the 10 years of their existence. This Belgrade company showed products from well known sources such as Marantz (Japan/Holland), Audio Note (UK/Japan), Bowers & Wilkins (UK), JM Lab/Focal (France), California Audio Labs (USA) and van den Hul (Holland), but also its entire not too small a range. This range has two preamps, both of which use tubes, and one power amp, as well as a separate Anniversary Series dual mono preamp with two separately housed power supplies and a power amplifier rated at 2x150W/8 Ohms. This prestige combo is slated for TNT review in the near future. It uses a dual mono construction throughout, and the power amp uses three pairs of high grade Sanken RET transistors per channel, powered by massive 4x36,000uF capacitors and two 600VA toroidal transformers. 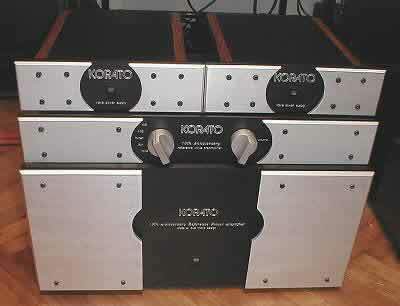 The other news is the new Korato pre/main amp combo, currently in the safe and qualified ears, er, hands of our own Geoff Husband, who will be evaluating them as soon as he's ready. This "mere mortal" combo offers tubes in the preamp and 2x100W/8 Ohms (but also better than 2x350W/2 Ohms!) 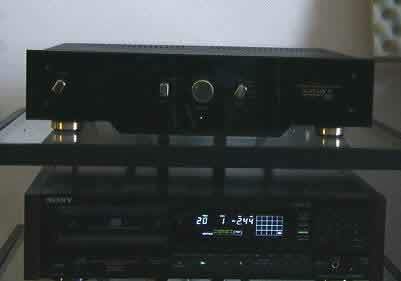 real world power, also in a dual mono configuration, for relatively speaking reasonable amounts of money. In conjunction with several models of speakers from B&W and JM Lab, and especially the prestigious Mezzo Utopia speakers (listen to them to understand that they are not at all misnamed - very near utopia indeed, a true tour de force for Monsieur Jacques Mahul, but so is the price), the new "small" Korato combo really shined, producing sounds one could listen to all day and keep asking for more. All cabling was courtesy of Mr van den Hul. Most types of music were played, from straight jazz, via fusion, to Eric Clapton unplugged, and all of it came out very well indeed. B&M Acoustics is a Belgrade company representing France's Son Audax and Japan's Fostex. Actually, Son Audax is owned by Harman International, but most will remember them as a company of high repute regarding speaker drivers for almost 80 years now. So it was then, so it is now, only more so. The range Son Audax offers is, mildly speaking, stunning, and most of it was on offer. However, B&M Acoustics also showed an impressive range of complete loudspeakers of their own manufacture, from design to final assembley, based on Son Audax drivers of course. There are three series on offer, from small and cheaper to rather large and heavy units. Obviously, the folks at B&M Acoustics simply adore piano gloss black finishes, in conjunction with stainless steel plates around the drivers, a combination I find odd, but notice many visitors were impressed with; however, you have your choice of piano gloss black, oak, cherry, palisander and other finishes, depending on the model and availability of the material of your choice. 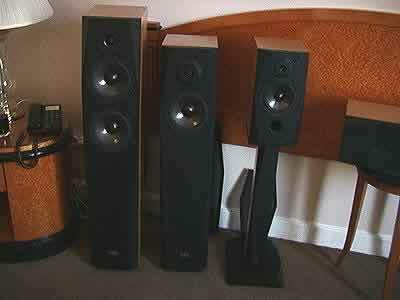 In fact, the tall and narrow speaker housing hides the fact that some of these speakers are proper three way boxes, but the bass drivers, ranging from 6.5 to 8 inches are mounted sideways, in an attempt to narrow the cabint down as much as possible so as to avoid or at least minimize refraction. It's somewhat surprising to sit down to listen to what your eyes tell you is a two way speaker and discover that it has much deeper bass than would be possible with just two drivers. Only then one bothers to investigate further, and sure enough, find an 8 inch woofer merrily firing away on the side. Speakers are delivered as matched left and righ channel units at prices I for one found hard to believe; for example, a real two way, floor standing speaker, in a D'Appolito array (with a titanium coated dome tweeter in between two mid/bass drivers) locally costs just $330, which is damn cheap in view of the driver and crossover component quality and design. The finish is good, but not stunning. 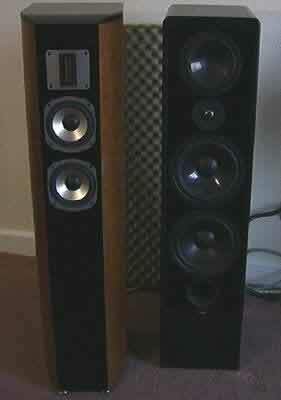 An odd one out was a speaker using a 10 inch mid/bass driver and a soft dome tweeter. Not many around these days, though Snell used to parade some models along those lines, as did Advent many years ago and KLH before that. I had my doubts, but they were soon done with after the speakers were fired up, driven by two massive Krell monoblocks, which received their signal directly from a Marantz CD-17 KI player. We got some impressive sounds and breathtaking dynamics, always a Krell forte, but followed by B&M Acoustics speakers much better than they had any right to. The price mismatch is tremendous, yet the sound obtained, while not on par with the Krells, was much less behind them that I would have expected offhand. Actually, I think the Krells were wrong amps for those speakers, but let's not get into that discussion now. To the best of my knowledge, B&M Acoustics is currently the only Yugoslav speaker manufacturer proper, with separate series, each with individual models at different price points. I was told they started to export, first sales going to Austria. Remember, while they mey be dirt cheap to buy from the manufacturer direct, due to size and weight, the shipping costs will not be insignificant, so make sure with the manufacturer first. Dayens is a company from the southern Serbian city of Sabac. 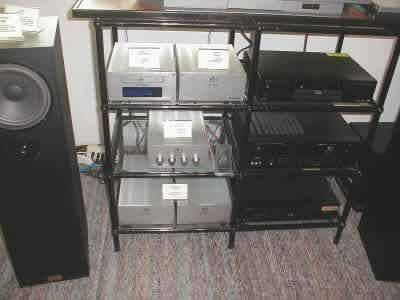 They seem obssessed with speakers, as they represent three speaker- only companies, and all of them from Germany. On the photo, you see two products by Germany's Quadral company ("Aurum Four" left, "Ergo RC-L" right), and they also represent Visaton (well known for its kits and components) and Canton. On show, they had a relatively modest line-up of models, but in all truth, Visaton alone offers around 30 kits, so it would be impossible to cram all that in less than five rooms, and Quadral would take another four or five, with Canton taking another five. 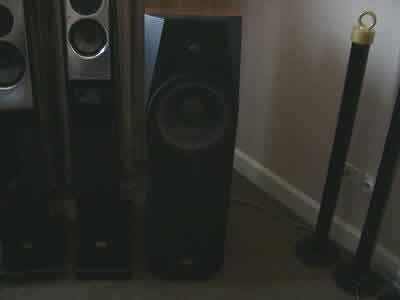 Therefore, a choice had to be made and they brough along two massive speakers and a miniature one, using an aluminum alloy mid/bass unit and a soft dome. Frankly, I was left unimpressed by the resulting sound, but this could just as well have been a result of inadequate drive, or a mismatch between the speakers and the amplifier. Some Quadral speakers have evil impedance curves and require muscular amplification to really come to life, as do some rather nice Visaton units I have heard so far. The little one on show produced some very coherent and rhytmic sounds, but was badly hampered by its low sensitivity (84 dB/1W/1m) on one and modest power handling capabilities (60W) on the other hand. It could not escape the sound of a small box, and its "bass" lines were at best lower midrange lines; if a subwoofer was ever rewuired, this was the case, but oddly enough, none was in evidence. Not to be outdone by big city folks, Dayens also presented a range of amplification devices, one integrated, one pre and one main amp. All look a little tubby with their centers sloping downwards, as if the middle simply cannot support the weight of the insides. These are discrete solid state electronics and appear reasonably well made; if price is also taken into account, then they would seem to offer a high level of perceived value. As for the sound, while good and without any obvious nasties, with good tempo and just about right warmth, I cannot say I was impressed, as it seemed a little veiled and on occasion wooly to me. On the other hand, I listened in a totally unfamiliar acoustic environment, with speakers completely unknown to me, so whether I'm right or wrong has to be investigated much more thoroughly than was possible on that one-off occasion. Go and read the Part II of this reportage!